FORCE: Ballers meets The Game Sometimes the battle off the field can be as tough as the battle on it. Action Lab have provided an advance preview of Force #1 out this November! Terrance Wright, the starting quarterback for the Tennessee Boxers, is at the tail end of his career. Hoping for one last big payday, he’s doing all he can to lead his team to victory at Supreme Bowl XXVII. But events leading up to the big game could possibly alter Terrance’s future in professional football. Will dealing with shaky finances and physical health, his scheming and calculating agent, a rookie quarterback that’s on his heels, and a personal relationship with the team’s operations manager take him to his breaking point, regardless of the outcome on the gridiron? 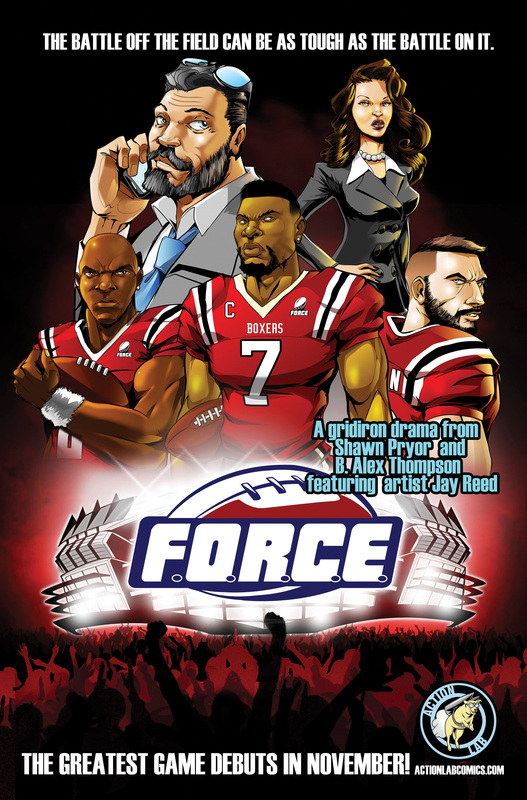 Welcome to the world of FORCE (Football Operations Rated Championship Elite), created by Shawn Pryor, B. Alex Thompson, and Jay Reed, published by Action Lab Entertainment. FORCE opens a new era of sports-drama series to comics, blending the hyperactive action on the field with the personal drama that takes place behind the scenes. Creator Shawn Pryor comments, “I’m a big fan of football films such as Any Given Sunday andVarsity Blues, enjoyed sitcoms/dramas like The Game and Ballers, and I’ve been wanting to do sports comics for a very long time. FORCE is the first in a long line of creator-owned sports comic projects that B. Alex Thompson, Jay Reed, and I can’t wait to get into your hands. FORCE #1 arrives in comic book stores and digital comics outlets on November 1st, 2017. Pre-order your copy at your local comic book store with Diamond Item Code SEP171037, or online comics vendor service.